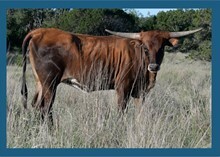 Joyous is longhorn royalty out of the heart of Jimmy Jones' breeding program. Her dam is "51" (Dixie Charlene). Her half-sister out of 51 is Horseshoe J Example, the 90" dam of Concealed Weapon. We are honored to have Joyous as one of our foundation cows.